As some of you may know, I have been doing cookies for the past few years and will continue to do so as long as I am able and as long as you want them. Well I'm coming to you for help this time. I already have it in my head what I'm going to do be doing but I would love to have some input. Now my own family (believe it or not) has ties to Clan Drummond and my husband's to Clan MacBeth. What I want from you is who do you belong to? 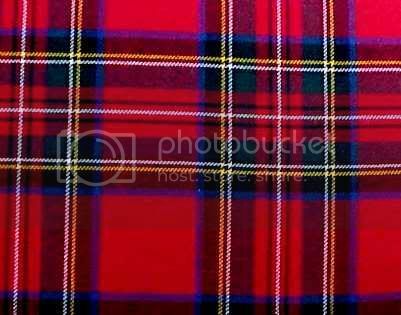 What's your clan tartan? If you could provide a picture of the tartan as well, that would be great. I am of Scots Irish blood (and Spanish! ), but my dad's family had been Irish so long, the Scots connection has been dimmed. 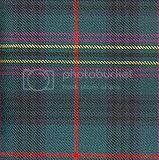 Therefore, I wear the Flower of Scotland plaid which is more universal. Mine is from the Murray clan. There are actually two and I'm not sure which one my family originates from. This is on my father's side with the other half being of Native American heritage. How about Scotland's flag, Landalish? There's a plethora of Stewart tartans. I'm sure mine must be the royal one, though, don't you think? Katie, there is NO DOUBT that you are royalty! Now to order my skirt! Oh, just found this bit of interesting history on the McQuillans, seems they liked a fight!! Also don't forget about the Lion Rampart. Girl, quit playing and post your tartan! Thanks for the others ladies. Thanks, Suzie! I had to marry into it, though! I thought of that, too, D, but wasn't sure how that would look on a cookie. But heck, Landa can create anything. I'm sure that ramparting lion wouldn't get the best of her! ETA: Hey! Looky what I found!! "Stewart Royal Mod" tartan!! Pairfect!!! Hey...anybody know Gerry's? That would be cool! That's a really pretty one! Very "jeans" friendly! Except, I'm still trying to figure out how Landa's going to make plaid cookies? You let me worry about that one. All those tartans photos that you posted are all very pretty, I love plaids and have so many plaids in my wardrobe especially around winter time. lol! I had to edit because I wrote he doesn't have a family instead of a family tartan oops! Think I had a wool skirt like that in the 70's, too. My maiden name is Stewart. Grand father was born and raised in Scotland. I don't have a clan that I know of. 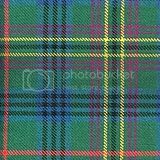 However, back when GALS was brand new I created the MacSporran Clan just for fun only to find out sometime later at a Scottish Festival that there really IS such a clan and I bought a tam in the tartan. I was blown away especially when I read the origins of the clan: MacSporran means 'son of the purse', and the clan is said to have been hereditary pursebearers to the lords of the Isles. So the MacSporrans were the Highlanders' ACCOUNTANTS!! And I'm an ACCOUNTANT! Hee hee it was meant to me. 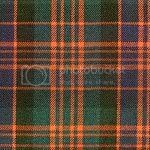 Here is our tartan. 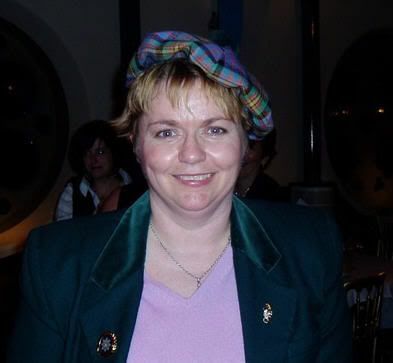 Here I am wearing the tam on Burns Night at Oran Mor in Glasgow in 2006. It is likely to make an appearance sometime in Las Vegas as well. 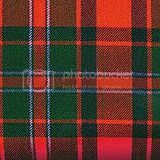 So my name is Kennerley... the Kennerley's haven't lived in Scotland since the 1500s, so there's no "Kennerley" tartan... but there is a tartan for the derivative "Kennedy"s! Also, tracing my paternal lineage far enough, I'm a Carrick! 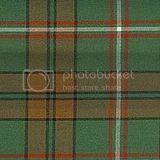 Last, but not least, my grandmother was an O'Neill, one of the few Irish families with their own tartan! I love ancestry. 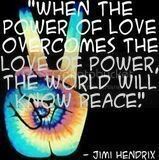 It makes me feel so connected to the world. Thank you ladies for helping me out. Keep 'em coming. I can't promise you that they will all get used but some will and I thank you very much.